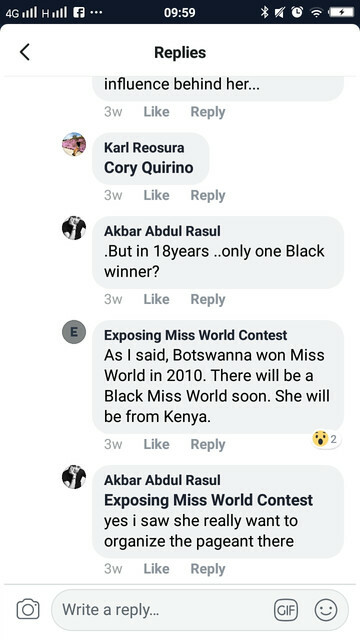 EXPOSING MISS WORLD PART 2 SHOCKING UPDATED!! 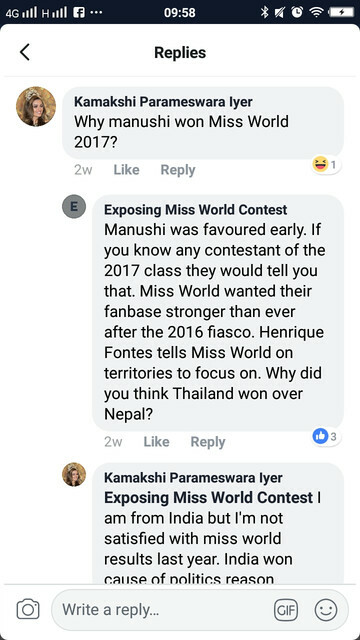 Taken from Exposing Miss World Facebook page. Last edited by lesham on Wed Jan 23, 2019 5:31 pm, edited 2 times in total. Last edited by lesham on Fri Jan 04, 2019 1:55 am, edited 1 time in total. Last edited by lesham on Fri Jan 04, 2019 1:52 am, edited 1 time in total. Holy f**k that is a lot of posts I am going to read this all in a bit, I skimmed these screenshots and when I saw the first thread about this I am not going to lie, I thought it was just made by Filipinos who were salty that Katarina was a clapper but I may have actually been wrong, damn. I always knew that the winner was whoever Julia Morley liked the most but this should be very interesting. 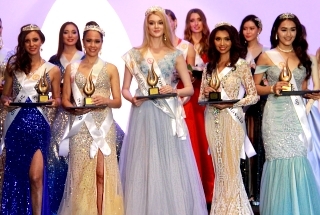 I don't understand why anyone would still want to waste time following Miss World. This pageant is a scam, pure and simple. 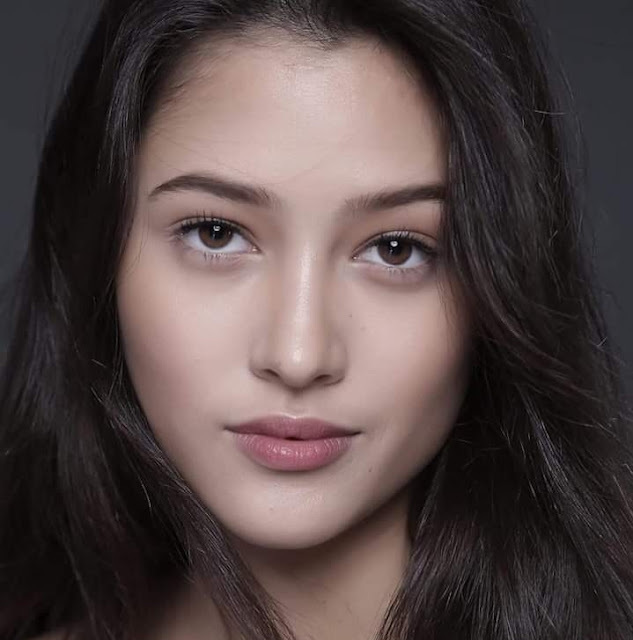 On the other hand, Philippines ND, Arnold Vegafria craves attention, and he thinks participating as judge in Miss World elevates him to the status of the rich and famous. News flash: crooks like Julia always want to hide behind a front, and unfortunately, Arnold is a willing buffoon. 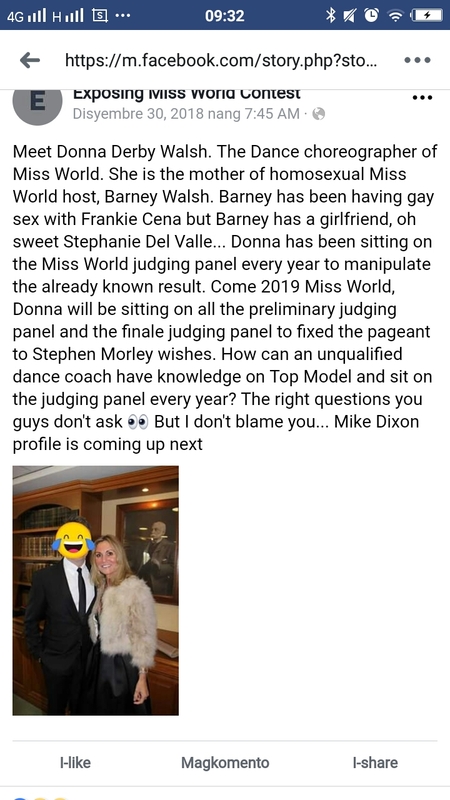 Me too I thought this was a salty Filipino page until I saw what he claims that Megan's win was also a business move and a fix. That got me thinking that maybe she was just to get Filipino fanbase (although I do think she's deserving). friend asan part1 nito? or updated ver to? wth! tingin ko d pinoy nagawa n2.. ngayon k lng nabasa laman loob ng MW.. those names? I am too lazy to care about this because it's Mess World. 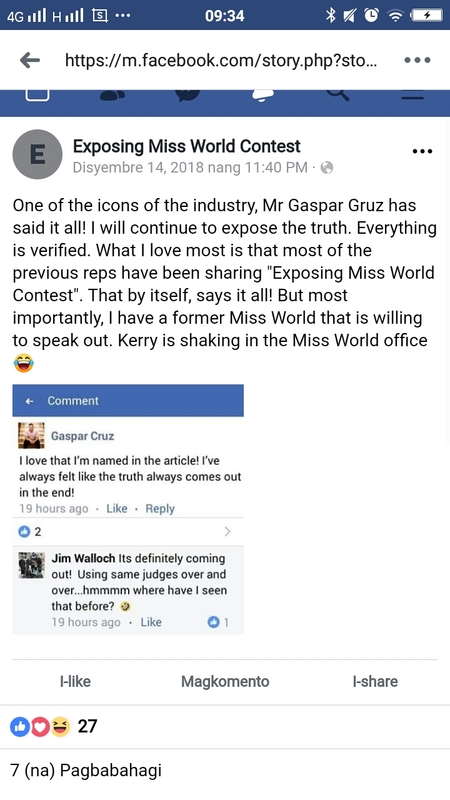 bwahahahhahaa I am so happy Catriona didn't win that fraud pageant and she won THE BEST PAGEANT IN THE WORLD. FunX3 wrote: friend asan part1 nito? or updated ver to? 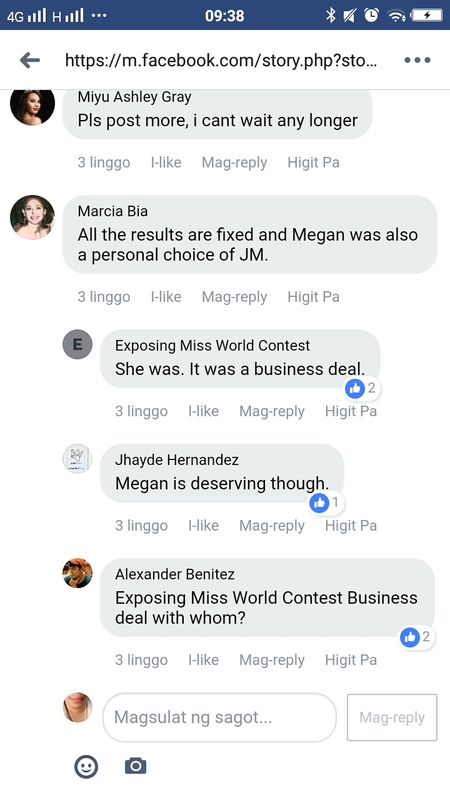 blunderer wrote: Me too I thought this was a salty Filipino page until I saw what he claims that Megan's win was also a business move and a fix. That got me thinking that maybe she was just to get Filipino fanbase (although I do think she's deserving). Mama Julia wanted us to host badly that's why Megan won (although she's also deserving). hauteegirl wrote: I am too lazy to care about this because it's Mess World. 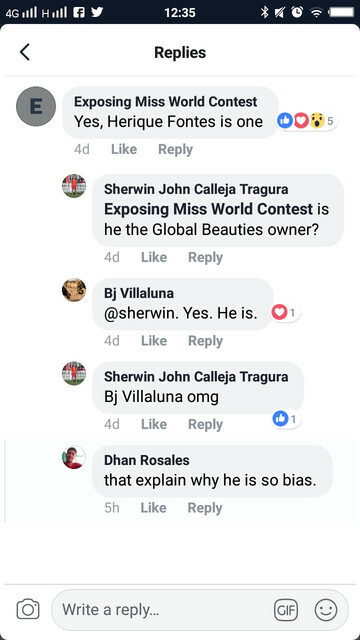 bwahahahhahaa I am so happy Catriona didn't win that fraud pageant and she won THE BEST PAGEANT IN THE WORLD. Of course, i already knew that. The China hosting alone and gave them their only home turf 2 Big 5 Pageant wins was already fuming with atrocities. Indonesia was next in line till the fans already knew their plan. So right now, they're changing their plans. Who can even deny that all gown sponsors in 2016 made it to Top 5. BWAAHAHAHAHAHHAHAHAHA DISGUSTING! 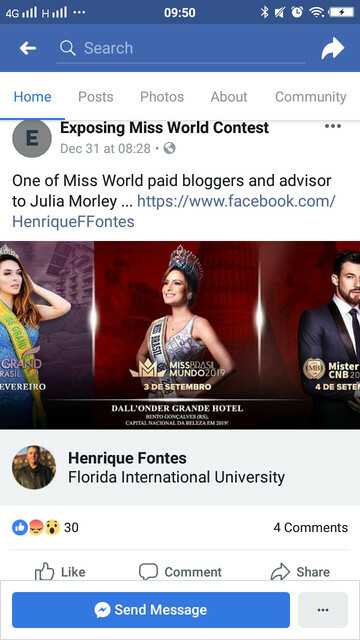 Sobra ka bes, ako naman halata naman kasi niluto at kung magdedepressan ako eh panalo na naman sila... Basta bangon lang.. Catriona's Miss Universe 2018 win is TRULY A VINDIDATION that she was CHEATED sometime ago! PERIOD!!!!! NOTHING FURTHER. PANSIN NYO. LAHAT NG UMAAPI AT NAGPAIYAK SA ATING "ALPHA FEMALE" UNTI UNTING KINA CARMI MARTIN. NOSI BALASI??? -ENTIRE MWO!....I'M EXCITED FOR THE HOLLYWOOD MOVIE "MISS WORLD SCANDAL"
-MEGAN YOUNG. LAOS ANG CAREER! -MARIEL BABOY - PATAY ANG CAREER ETC. -ARNOLD VEGAFRIA, BESSIE AND THE ENTIRE Miss World Philippines UNDER ARNOLD'S STEWARDSHIP - IT WAS A MESS! krissynelli wrote: PANSIN NYO. LAHAT NG UMAAPI AT NAGPAIYAK SA ATING "ALPHA FEMALE" UNTI UNTING KINA CARMI MARTIN. NOSI BALASI??? I cannot remember na inapi ni Megan and Stephanie si Catriona. What are those incidents that made you say so? Because, they were doing all their might to kill the FB Page who tried to spill the worms out of the can. But No! Many Miss World former contestants and even NDs are now coming out and willing to share their stories. The ghost of their own evil deeds is now haunting them. So Catriona was lucky enough that let her enter the Top 5 in 2016??? Coz they could not deny the fact that she aced almost all of the Fast Tracks. In 2018, it was so obvious that they were going to crown a Latina considering they started their own Latina website/channel (or whatever that is) to promote the dying TV Show. 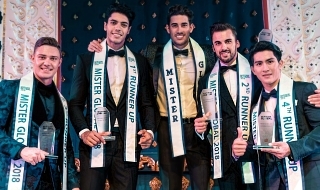 Surely, this pageant is going down the drain. I want them to expose where do they put the millions of dollars raised in their charity fundraising events. That will be the most interesting part of all this brouhaha! 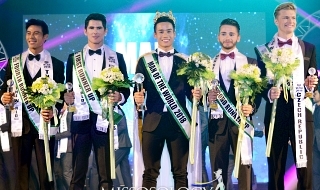 And to Arnold Vegafria, you are the dumbest ND the Philippines ever had in any pageant.